Are you tired of spending money on the ridiculous prices of dog food? Did you know you could make your own dog food? Not only will you save on expenses, but you could also contribute to your dog's well-being. 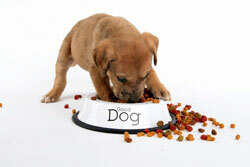 Before you start, it is important to know that dogs, like humans, require a balanced meal and a balance of nutrients. A simple mix of meat (40%), veggies (30%) and starch (30%) should be the base of every meal. If your dog has always eaten commercial dog food, switching to homemade food is great, but remember that you need to transition this process slowly. Start by combining dog pallets with cooked food first and ensuring that you provide an adequate variety of foods. Make your own dog food. Save on supermarket bills and ensure the health and well-being of your pet. If your dog has any know illnesses, it is advisable to check with your vet if you can prepare homemade food for you pooch. Regardless, it’s a good idea to show the vet your suggested meal plans to get a professional opinion before making your own dog food. You can feed dogs any type of meat so long as it's cooked. If you feed your dog chicken, ensure that you have removed all the bones. Chicken bones are very sharp and can cause damage to your dog's digestive system. Organ meat such as kidneys and liver is also a beneficial contributor to your dog’s health, so try to include these as much as possible. When preparing your dog's meal, try to change the mix every day or few days so that they enjoy a variety of foods. You should also remember that, once again, like humans, dogs enjoy flavor — don’t think you can trick them into eating bland tasting meals. Garlic is a great additive as it not only adds flavor, but it has been said to be a natural flea repellent.